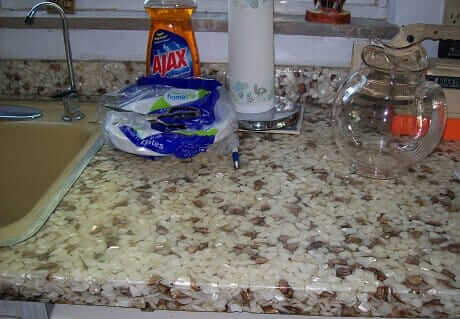 Home » By the Decade » 1960s & 70s » What is this 1960s countertop made of? Targinol? Luster Rock? What is this 1960s countertop made of? Targinol? Luster Rock? Wow, does anyone know about countertops like these? Becky recently bought a time capsule and her french provincial kitchen (I’d call it) includes these countertops. Reminds me of these Fritz floor tiles. Anyone work with this back in the day who knows? Kind of, an early-days version of Silestone or the other composite-quartz countertops sold today. I love it!! 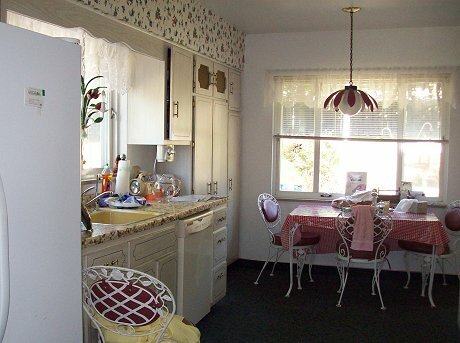 And that kitchen, too (nix the carpet and get a counter-depth fridge.) Note: These are photos from the walk-through before Becky bought the house. She is talking about gutting — argh! Becky: Live with the house a while, I implore you — I sure bet you can learn to Love this House You’re In! My dad ran a TV repair and Luster Rock business in the 60’s and 70’s in Eastern Indiana. I remember he roughly quit both before I was a teenager. I remember when I would visit at age 3-4-5 etc. the large 55 gallon drums of the resin, and all these different (also smaller drums kind of remembering not metal – perhaps strong paper?). Anyway he had probably 30 to 50 different piles of rocks to choose from, I used to pick them out and play with them and he would let me decorate sometimes the stuff he was working on . Used a table to pour a base of resin into to create a small topcoat, then put the rocks in, and then continue the pouring of what ever resin (or resins) to harden. I remember he made this for table labs, kitchens etc… He was older and past away in the 80s while I was in my teens. My mom and him seperated when I was 2, so I didn’t spent a ton of time with him growing up, but I do remember going on some house calls etc. Lastly he made it into building siding as well, without the resin, so the wall was course. Basically did it on plywood that was mounted to the building with the luster rock dropped into the base resin on the bottom so you would only see the rocks. Hi All. I used to work for a cabinet company in Wisconsin and made these countertops. (Vanity also) It was made out of a polyresin and had a plywood backing to it to prevent warping. Also aided in installation. You could put just about anything in it from mother of pearl chips to marble chips. we once made one that had a guys name spelled out in silver dollars. Anyway, it was state of the art at that time. Very durable and beautiful. If it did crack, you simply got some resin and catalyst and filled the crack. Sand it smooth and your done. Maybe this product should make a come back?